There has been sewing in the workroom just lately. I'm still working on my current projects, but I won't see a finish on any of them soon, so I selected a UFO and concentrated on it until it was finished. 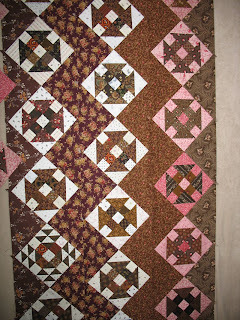 I finished piecing these True Lovers Knot blocks early this year, but ran out of the shirting for the sashings. I did find some more, but not enough for my original plan; so I made an executive decsion and made the sashings smaller, and substituted another fabric in some of the borders. 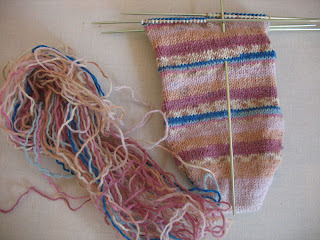 It made good stashbusting sense to use what I had rather than buy a whole heap more. I used nearly 3 metres for the sashing and triple border, so I'm pleased about that. Another project basket emptied! We've been busy with business stuff lately, so there's not much else to tell. 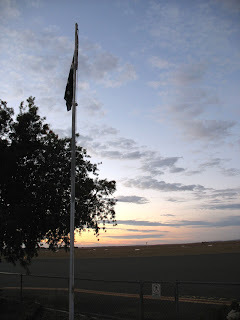 These are a few photos from the Pirie cemetery, just after sunrise on Anzac day. 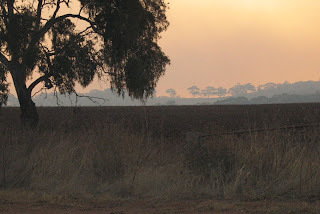 At that hour of the day it is a beautiful place, with it's avenues of pepper trees, melaleucas and bottlebrush trees. It was one of my favourite places as a child, which sounds odd, but it was never a morbid place to be. 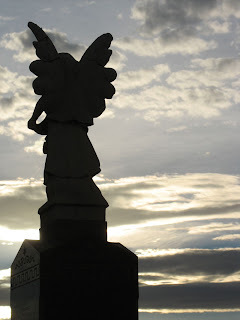 Mum took us and showed us the family plots, and then while she tidied them up we would wander through the rest of the place, reading the old, out of fashion names on the headstones and admiring the carvings. 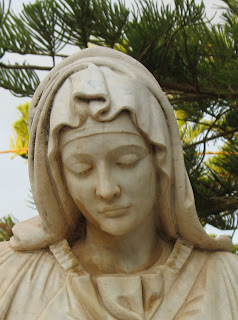 We always ended up in the Italian section, where the graves were smothered in brightly coloured plastic flowers and silk flowers in glass domes, along with statues of saints and china wreaths. 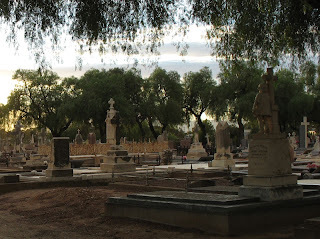 It was such an extravagant display of grief, compared to the quiet, faded beauty of the rest of the place. 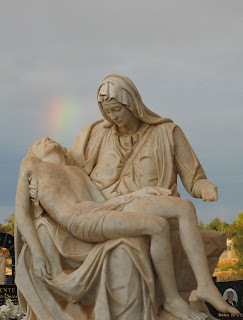 This Pietà is relatively recent, and is about 10' high; it's quite compelling. The little rainbow appeared just as I took the photo, and vanished minutes later. What good luck that I had the camera ready. 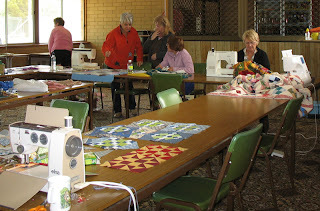 It was patchwork group yesterday, and we spent the day busily making blocks for our current projects. At one stage I wandered around taking photos of what people were working on; Pauline, in the orange shirt, was very gad I did, as her blocks got mixed up and she had to borrow the camera to see what order they were supposed to be in. 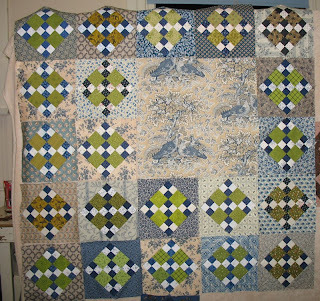 I'm working on my blue and green blocks again, I have all the pieced nine-patches made, 81 in fact, and now I'm adding the triangles to each block. The colours are looking wonderful together, but I'm quite worried at how much fabric I've used already. I have hardly any intense, deep blue left and I can't find any more to replace it either. I'm on a mission from now on. I've started setting together the mini Monkey Wrench blocks, and they are looking good too. Each of those zigzag setting strips takes a quarter metre of fabric, so the setting alone will bust 2.25m. That's good news, as the fabric seems to be coming in faster than it's being used up. I've had some queries about the recipe for Anzac buiscuits. 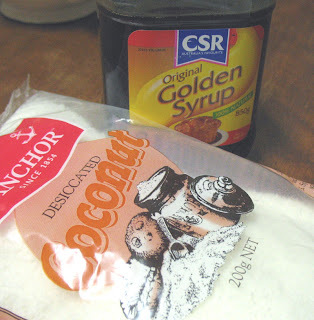 I don't know the exact replacement for Golden Syrup; it's like a very light treacle, and treacle is similar to molasses. Also our dessicated coconut is similar to shredded coconut, but very dry. It's so hard substituting ingredients; I still don't know what to use instead of graham crackers. We don't have them over here. 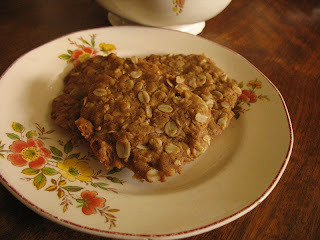 Most Australians have an opinion whether Anzac biscuits should be hard and crunchy, or crisp and chewy, or cakey. The original biscuits were baked hard and crunchy so that they would keep on the slow sea voyage to the troops overseas. I personally will only eat them if they are crisp and chewy, and these were just right. They MUST contain rolled oats and golden syrup or treacle to be authentic; I have noticed trendy versions with dried fruit, but that's not part of the original recipe. 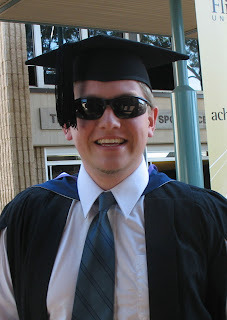 It was nephew Rob's graduation ceremony Friday morning, at Adelaide's Flinders University. We knew it would be a struggle to get there in time if we left on Friday, so we booked a motel room and drove down early Thursday morning. We had a leisurely visit to a Spotlight store, and bought a few bits and pieces; I'm on the hunt for vibrant dark blues, but I'm not having any luck. I will have to search further afield. From there we went to Ikea, and came away deeply disatisfied that we don't own a ute or van so that we can stock up on their modular furniture. We could have such fun there, if only we didn't have to get it home somehow. 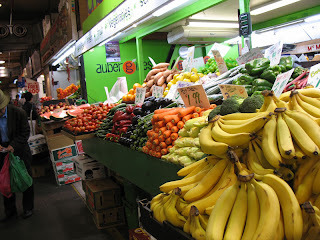 We went to Central Market, right in the middle of Adelaide; it's a fascinating place, full of fresh food, gourmet and organic produce. 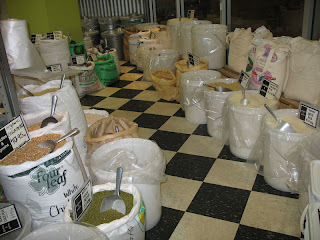 We didn't have time to do more than rush in to the organic wholefood place and grab some soy flour and snowpea seeds for me, and gluten free flours for Mereth, and then we had to get going. I also detoured to the Adelaide Nut, and picked up some of my favourite mustard broad beans; they bring tears to the eyes, but I love them anyway. On the way home we decided NOT to get lost, and stayed on the highway, which was boring but more direct. 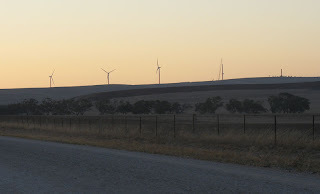 We did take a quick trip down a side road to have a closer look at a windfarm that is being built. 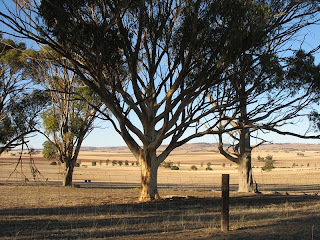 There are several in South Australia, and yes they probably are a bit of an eyesore, but we can't ignore the good they do. It will be an amazing sight when the whole line of them is up and running. 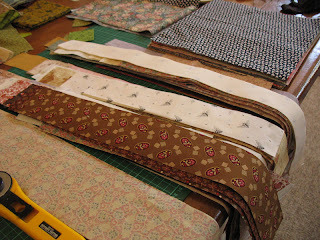 I spent several hours cutting up scrap fabric for the strip drawers, and 10.5" backing squares. I cleared out a whole drawer of bits and pieces, 7m in all. That made me feel very virtuous. I still have nothing in my 1.5" strip drawer, and I'm making 4 projects that neeed them, so I have to get busy on that. I haven't added up the yardage that I've cut for the projects, but it's a lot. Pity I've bought so much lately, because I have a long way to go before I can say the stash is dwindling again. It doesn't help when we buy rolls of wide backings, with 12m in each roll. 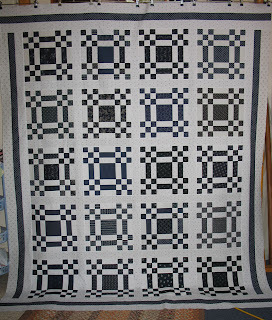 But that's for customer quilts as well, so I can't really fell guilty about that. The main thing is to keep using what we have, and keep the quilts coming. Last night I went round to Mereth's place, to watch TV with her and the SIL. 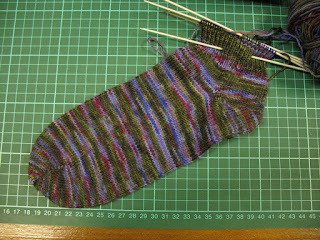 I took my knitting, another sock that I am making for a friend, and managed to get the heel turned before it was time to call it a night. Mereth offered to drive me home, as it was rather too cold to walk. When we got to the first corner I realised that not only had I dropped the ball of wool, I had dropped it before I got in the car. We stopped and I had to walk back down the road, reeling in my wool as I went. It was so funny, especially as we could have driven all the way home without realising! As it was I just have a tangled skein to sort out. I think in future I'd better get me a knitting bag when I go visiting. 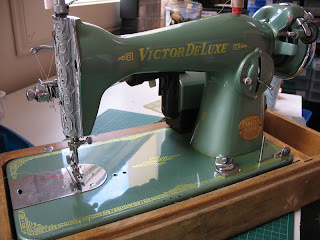 My new sewing machines are a Victor DeLuxe, and another Peerless treadle. The Peerless is in beautiful condition, apart from a badly mended belt, but the Victor needs help. 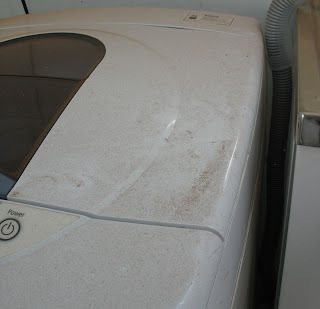 The machine itself is pretty well spotless, but the wooden base and case are water damaged. I will keep a lookout for a ruined machine on a good base, and swap them over. I love the green paint, gold decals and silver trims; very stylish. The Peerless is just as pretty as my other one, and moves so smoothly I can treadle with one foot. 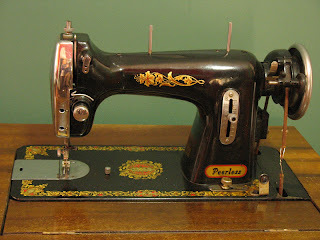 If we have another power failure Mereth and I can keep on sewing now, as we have a treadle each. I came very close to having a migraine on Sunday, had to lie around with my eyes shut until 3 in the afternoon. What a wicked waste of a day! All that good sewing time wasted. I recovered enough to knit on my current sock after tea; this is beautiful Welsh wool called Jitterbug, and it's making a delicious sock. I'm enjoying every stitch. 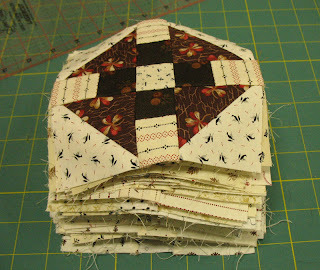 We went to the patchwork group today, and I made another 15 of my Monkey Wrench blocks. I have 50 as of tonight, 31 to go. I'm getting enthusiastic about this project now, so I will probably keep working on it until it's done, ignoring my rule about only doing it at Patchwork Group. That means I need another easy project to take along with me; I just love having permission to start something new. 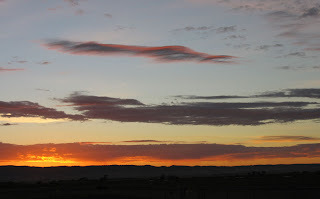 We have been a bit distracted over the last few days, so no quilting to blog about. We had out-of-town friends drop in, and our oldest brother and his wife are staying with Mereth, and there has been a lot of socialising going on. 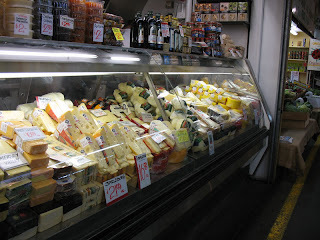 All good stuff, but nothing for the blog. On Saturday we went to a local folk fair, and had a scout around for wooly, quilty stuff, but there was nothing that caught my eye. 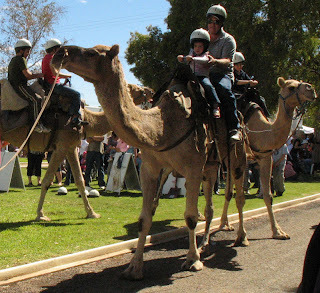 I did admire these camels (they were wooly), who looked superbly disdainful. I guess when you're so tall you have to look down your nose at everything. 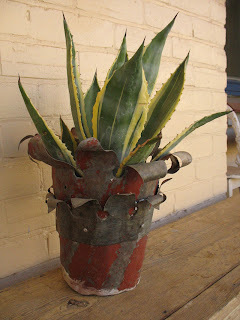 I bought this agave from a local craftsman; the pot is made from recycled corrugated iron. The pot and the cactus managed to bite me several times, you'd think the ensemble would be glad to go to a good home. Being drought tolerant should help them survive in my backyard. 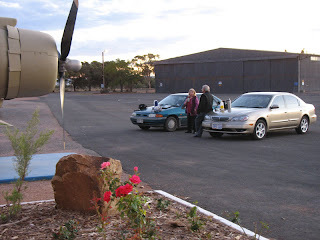 Then on Sunday it was off to Adelaide to pick up a couple of Ebay finds; more sewing machines. I will put photos up once I have cleaned them up a bit. I like this collecting thing, and I like rescuing old machines that are in danger of being tossed on the scrapheap. We stayed with Mereth's Firstborn Son, and watched Sweeney Todd that night. Hmmmmm. I can safely say I will never see it again; it was sort of Edward Scissorhands meets Jack the Ripper, with songs from Aladdin. I have no idea what was going through their heads when they decided to make it. Next morning we ran errands and then took off for home. Now I don't ascribe to that whole 'women can't read maps' rubbish, because both Mereth and I can navigate perfectly well. However, South Australia has the worst road signs of any place I've ever travelled. There just aren't any, most of the time. We have dubbed the area around Gawler 'The Barossa Spiral'; it's like the Bemuda Triangle, but not terminal. If we try to bypass Gawler we get lost, every single time. Not lost in the true sense, because we just keep heading north and we know we'll get home eventually, but we have no idea where where we are in the meantime.